Chain Length: 27" - Pendant Length: 3"
4mm Gold Plated Figure Eight chain and Toggle Clasp. Vintage Japanese glass turquoise speckled nugget. 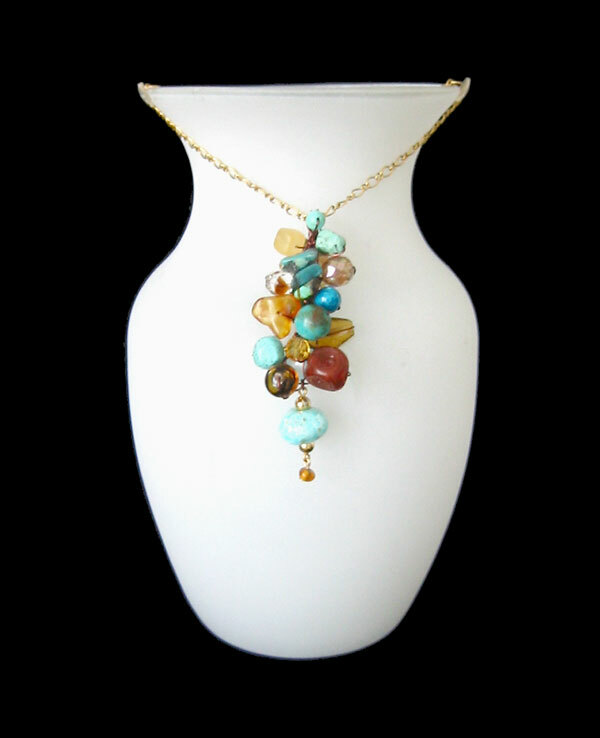 Semi-Precious Chinese Turquoise round, chips, and Heishi. Vintage amber glass round with black swirls. Czech glass crystal 'Givre' bead with topaz inclusion. Rare vintage "Harvest Spice" glass square. Vintage German Light Topaz/Aurora Borealis Crystal. Vintage Furnace Glass Light Topaz teardrop. Vintage German glass light turquoise nugget with swirls. Vintage Swarovski Crystal Comet/Aurum (24kt) Disc Crystal. Faux Turquoise nuggets and rounds. Vintage Czech Light Topaz crystal. Small vintage German Lucite 'crackle' oval.